This month we look at the UVI BeatHawk and Roland Sound Canvas For iOS apps. Never afraid of a challenge, Arturia have undertaken the first software emulation of the celebrated Oberheim Matrix 12. A–T’s new flagship headphones are also the company’s first ever open–backed design. We put them to the test. Vintage Strings is a Kontakt library intended to sit alongside Vintage Vibe and Vintage Horns and, like those products, uses original samples recorded in a fashion intended to replicate how it might have been done in Motown. I tested CME’s first Xkey 25-note compact keyboard for our March 2014 issue. Now they've added an extra octave and released the Xkey37. If you’re seeking a warm’ sonic character and effortless compression, this channel strip could be just the thing. The Dreadbox Erebus is an unusual small–format synth with an inviting price tag. Of all the record producers and engineers I’ve interviewed over the years, few impressed me as much as Joey Sturgis, so when I heard that he was the Executive Producer of Drumforge I was very keen to take a look at the product. Genelec take an unusual approach to speaker design for this distinctive three–way monitor. JBL’s Eon range has had a major makeover, with all-new cabinet and amplifier designs, and the addition of Bluetooth remote DSP control. There are plenty of options when it comes to miking guitar amps, but JZ’s latest affordable offering does an excellent job with minimum fuss. This page contains a directory of all media pages that hold the associated media for August 2015. The author Michael Williams began his audio career as a BBC technician in the early 1960s, but he is better known today for his teaching and the many papers he has presented to the AES on the science of stereo and multi-channel mic arrays. The fifth of MusicLab’s ‘Real’ virtual guitar instruments, RealEight is modelled on an eight-string guitar, currently popular for metal, prog metal, epic rock and all things dark and demonic. Novation’s Audiohub 2x4 combines an audio interface with a three–port USB hub. Signal, deals with pulse sounds and is described by Output as the world’s most powerful dedicated pulse engine. An accurate tuner is an essential tool for live performance and studio work, but especially so for doing guitar setups. The new Peterson StroboPlus HD is accurate to 1000th of a semitone and features aback-illuminated LCD. Double basses are notoriously difficult to amplify live. Have Danish mic makers Remic cracked it? 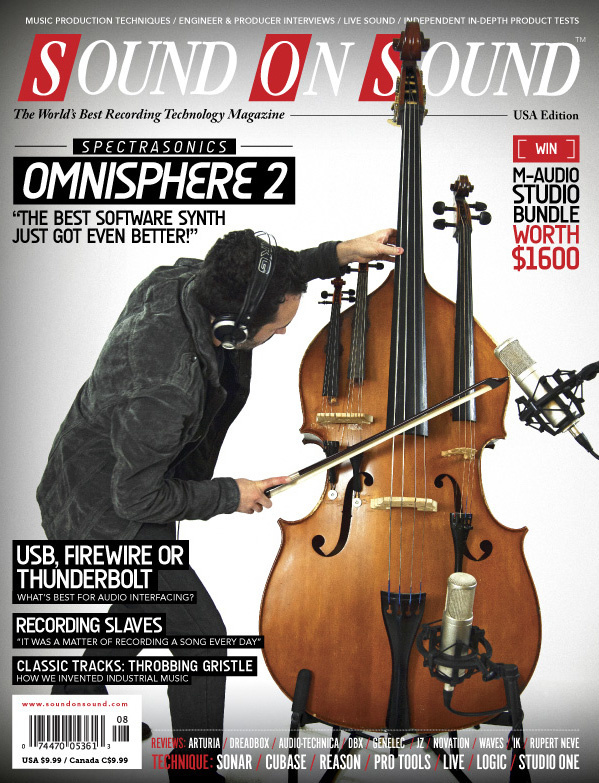 These files accompany the Sample Shop articles in the August 2015 issue of SOS. As it reaches its second incarnation, we ask: is Spectrasonics’ Omnisphere the world’s best soft synth? Thanks to the addition of powerful pitch-correction and manual time-warping features, Revoice Pro 3 offers a complete vocal-processing toolkit. The phase-style effects created by these two new TC Electronic TonePrint-series pedals are anything but ordinary. In modern productions, reverb often isn’t just reverb. Waves’ latest plug-in offers all the extra tools you’ll need. The new RV7000 MkII Reverb is the star of the Reason 8.3 update. Spice up your drum tracks with Sonar’s built-in plug-ins. Read more about Beat It! Use Cubase’s new VST Bass Amp to recreate the sound of Royal Blood’s doubled electric bass. A combination of technical wizardry and old-school craft helped Bernie Herms and Andy Selby bring Josh Groban’s Broadway album to life. Exploiting Memory Locations to the full will revolutionise the way you work with Pro Tools. Live has plenty of tricks up its sleeve for working with MIDI notes. Explore the wavetable section of Retro Synth to make your own unique sounds in Logic. This month we introduce Studio One users to some of the riches on offer in the new version 3. This month's selection include Ellie Goulding, Beck, The Book Thief soundtrack from John Williams, Jess Glynne and that all time classic mix, James Brown 'I Got You (I Feel Good)'. In this video interview we meet the so-called “Einstein of live recording” to talk production, drum processing and when (and when not) to quantise. Pete Keppler’s career has seen him mix shows for some of the biggest artists in the world. We asked him how it all happened. Read more about Slaves - Are You Satisfied? Joseph Dobson gives us an insight into a day in his technical support shoes! Paul White discusses the differences between what measures well on test equipment and what sounds good. Throbbing Gristle’s highly individualist approach to music extended as far as making their own instruments and, ultimately, their own genre. You might be the next Mozart, but if you can’t meet impossible deadlines, no-one will hear your music on TV. Studio tool or collectors’ item: what has become of the large-format mixing console? Buenos Aires remains one of these places in the world where rock & roll still plays a vital cultural role. Media content for the August 2015 issue.